That was spread across April and May of 2010. Haven’t done any since then, and don’t plan to ever again. And yet, even though we stopped doing what’s generally considered the most necessary SEO tactic, traffic from search has skyrocketed since April 2010. Search traffic is approaching six figures per month, and in May search traffic was 5x times higher than a year ago. Rather than link building, we’ve been doing what I’ll call authority building. It’s more commonly known as Public Relations (PR) or Media Relations. Those are some great mentions for any business, right? But understand that this is a small business owner we’re talking about — not some national or even regional company. I know that not every small business owner can replicate the success we’ve had, but here’s an overview of what we’ve done if you (or your client) want to try. 1.) Prove your expertise via blogging. If you want USA Today to treat you like an expert source, you have to prove it on your website. This small business owner has been blogging since late 2009, creating vital content and becoming a brand. 2.) Subscribe to HARO and look for opportunities. We use the free subscription that sends three emails per day to MY inbox. I read through the opportunities, cut-and-paste anything that’s potentially relevant, then email the client for the final decision on what’s worth pursuing. This is important: If interested, the client contacts the journalist directly. I don’t do the outreach. The office manager doesn’t do the outreach. It comes straight from the expert — the person that US News & World Report wants to hear from. 3.) Refer the journalist to relevant articles already published. With a great library of vital content (from #1 above), it’s easy to show journalists that you know the subject and can be the needed expert. 4.) Use social proof. As you start to get cited in media outlets, blogs, or wherever, do an “As Seen In” chart like the image shown above. It’s social proof. The writer from Woman’s Day is more likely to want to talk to you if she can see that you’ve already been interviewed and cited by other outlets. It’s better than link building, in my opinion. Sure, you can get links from some of these media mentions, but you won’t get them from each media interview. To me, the link is great, but it’s secondary to just getting the exposure. 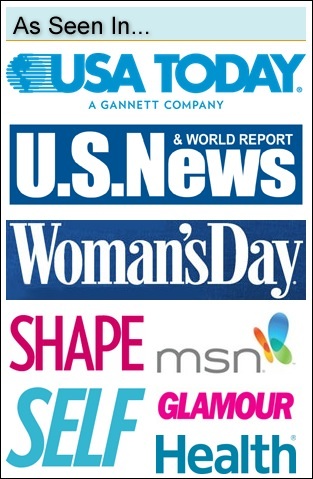 Exposure in major outlets like USA Today or Glamour or MSN is the kind of thing that creates trust and authority. When you have trust and authority, it’s easier to sell products and services. And that’s how you reach your ultimate goal: increasing revenue and profits. I especially agree with #5 Be Patient. I have been a subscriber to HARO for months and have yet to see to respond to, however, I do get ideas from the requests. That’s a good point, Roger — even in cases where the client decides not to respond, just seeing what info the media is looking for often leads to new ideas for articles. Beautiful follow up post to our conversation on #seochat yesterday! Thank you for the mention! Thx Greg. It was fun to be able to join in the discussion like that, and even better to get some blog post inspiration! Great point. We’ve had success with HARO as well. I used to be a reporter before my current position and HARO is a resource that real reporters use to get info for stories. Couldn’t agree more with this mindset. Link building is for machines. Reputation building is for people! Thanks, Matt. This article reminded me that I’ve gotta get one of my clients on HARO. Let’s remember, too, that reporters are all over Twitter. Thanks for this Matt, are you aware of anything like this existing in Australia? Hi Matt, thank you for the alternative thought process – as with Dane above, do you know if there is a global portal such as HARO for countries outside the US? Dane/Brendan — I’m not aware of anything similar outside the US, but that could be because I’ve never had to look. If you find anything, let us know with another comment! Hi Matt, good to know that SEO service providers are also getting smarter day by day and lead the industry if keeps finding the right tracks as you are doing and giving a great response to your clients. I also hired an SEO company in past but they caused loss to my traffic and status of the site and then I never thought of hiring another, after reading this article I’m thinking to grab this idea of PR making. Thanks for submitting this case here ! Replying quickly to reporters’ requests is a huge part of being chosen for their articles. The list of HARO subscribers continues to grow, and with it, more competition for that precious PR. It pays to check their daily updates the moment they enter your inbox. If you snooze, you lose! HARO is US based right? Sounds great but does anyone know of a UK version? I don’t, Matthew – sorry. I am SEO from Spain and I like work on this way. In my opinion, this is like a high quality linkbuilding only for high PageRank website or press. And it is more efficient a long term. The only problem is that you need time, and client does not have pacient. Anyway, thank you for reminding me I am on the right way of doing SEO. Hi Matthew, HARO does have options for UK residents. I use HARO and I am based in the Midlands, so it’s certainly worth giving it a go. Great post by the way – I’m sure everyone is interested in finding more time efficient and effective results without having to link build. I’m with you and probably most people out there, absolute bane of my life and minimal ROI. Matt, thanks so much – This article just made me realise that I’ve missed an opportunity for one of my clients to gain some social reinforcement for their brand. A few weeks back, one of the big TV stations here in Australia ran an inspirational feature story about a personal trainer client of mine, who helped rehabilitate a young woman after she had suffered a serious illness. Given the nature of the story, we obviously didn’t think to push it as promotional leverage. However, the story inspired many people who saw it on TV & social media so I think including some social proof on the website (As featured on NBN News) will be good for the WellFit Personal Training brand. Thanks again and keep up the great work. Yes, be patient. I have subscribed to HARO for about 6 months now and it does take a lot of emails to get a response. I have been featured in some smaller business blogs and it is worth the little bit of effort for the (hopeful) payoff. I actually had a prospect that I told about and his first submission was featured on New York Daily News. One year later and in a dynamic world of link building this advice still rings true. Thank you Matt! I signed up for HARO and have yet to get a response to my replies. My email box is flooded every day with requests, but so far no results. I agree with you for the most part. I think the core idea of this post is spot-on, and I like your idea of emphasizing authority building rather than link building, and going for big editorial coverage rather than the sort of low-quality, self-published links that falls under what you call “traditional” link building. I’m not sure I agree with your recommendation about the “As seen in…” chart. I think these sites visually clutter a page, distracting the user by displaying a bunch of attention-getting brand logos. When I view a website, either a web abb or a business’s website, I tend to react negatively when I see these charts. I think that a better way to achieve this same effect is to integrate the media mentions of your group into your site in a more natural way. I like it when businesses have a press page. That way, instead of shoving the information in my face on the homepage or some other place where I’m not looking for it (and probably not interested in it), I can click on this page if I’m curious whether or not the business has received big media coverage. I like it best when the press page has headlines and excerpts, and links to actual articles. This fits in the “show not tell”. I don’t care whether or not a big media outlet mentioned a website or business, I care what they said about it. I’ve seen some companies display these big collections of logos and no links to the original article…and in some cases I’ve actually done google searches and been unable to find any article mentioning the business–and in that case I wonder if the company is being dishonest. Rather than risking this (because some news items are taken down) I think it’s safest to quote and cite the actual pieces where you’re mentioned. And…if the mention is tangential…maybe it’s not worth citing, just appreciate the benefit you get from the mention and move on. I only think feature articles and major commentary is worth drawing attention to like this.